Drosophila Cells in Culture, Second Edition, includes comprehensive coverage of cell lines, methods for creating cell lines, methods for genome engineering, and the use of cell lines for genome wide rNAi screens. This publication summarizes over thirty years of experience in the handling of in vitro cultured Drosophila cells alongside recent methods and functional screens. Early and experienced researchers studying drosophila in developmental biology, genetics, neuroscience, and across the biological and biomedical sciences will benefit from this expert knowledge. Guy Echalier is an esteemed expert in the research of Drosophilia, having over thirty years experience handling in vitro cultured Drosophilia cells. Norbert Perrimon is a leading researcher in developmental biology. His current research pertains to using Drosophilia as a model system to characterize the responses of cells to external signalling. 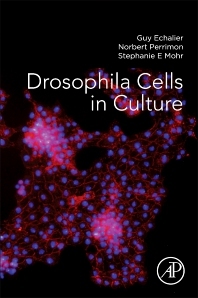 Stephanie E. Mohr is a leader in the field of high-throughput functional genomics screening in Drosophila cultured cells.